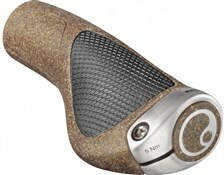 The unique qualities of cork means that it is antibacterial and hypoallergenic. Cork's natural damping qualities also make it an ideal grip material, and its low density mean the resulting grip is a lot lighter. 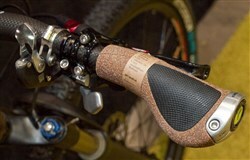 The BioKork grips use 40% cork, sourced from sustainable forests in Portugal which is certified for its ecologically sound production. This ecological theme is continued throughout the rest of the grip. The inner core is plastic reinforced using natural fi bre, which make up 40% of its mass. 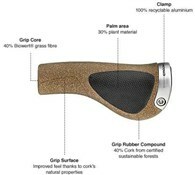 In place of mineral oil, the gel in the palm section of the grip is vegetable oil based. It is all a result of Ergon's “GreenLab” initiative. Excellent product that gives great comfort and a lovely feel of the Cork effect; I previously had the grey plastic version and this is, in my opinion, far superior! They do the job i wanted them for which is to stop fatigue,give a good grip and provide comfort. Attractive looking and well made, over long journeys they certainly are a boon. Recommended. Having had the GP1 standard version for a while I am happy with the BioKork version. The grips are a little less rubbery in feel and I find the grip as effective. The shape and contours are exactly the same quality grip that minimise or eliminates for me any hand or finger numbness during long rides. Ideal for touring or daily commutes.I like the green credentials too as the grips are made from cork and biodegradable materials all packed in recycled packaging.